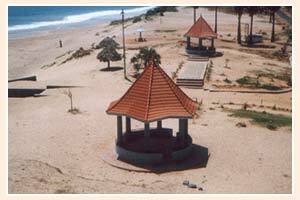 A unique beach where the confluence of the Arabian Sea, the Bay of Bengal and the Indian Ocean happens is the Kanyakumari Beach. The coastline is almost regular except for some land projections in to the sea. Also, this is one place where on Chaitrapurnima, you can see the sun setting and the moon rising simultaneously. One cannot sun bathe on the sands of the Kanyakumari beach as the shore is rocky and an artificial wall protects people from going afar. To get the panoramic view of the beach, you can go to the lighthouse that is present there and enjoy seeing the waves of the rough sea beating against the shore.